Hi guys! Is it a s scalding hot where you are too? It's been insane over here. When it's so hot I absolutely do not feel like doing my nails. I feel like it turns all my polishes gooey and it takes ages for them to dry, no fun! But, I hate having chipped nails even more..so I did them anyway :p. Anyway, today I've got a bright and summery skittelette for you! For this manicure I used 4 different base polishes, one of which is a new Kiko polish I picked up a couple of weeks ago. It's number 330 and on the English website it is aptly named Lilac. It's a gorgeous soft colour and it applies fantastic, especially considering it's white based! 2 Thin coats was all I needed. For the other nails I used Zoya Mira, Wet 'n wild black crème and OPI Alpine snow. I wanted to keep this skittlette kind of consistent, so I went with different kinds of round shapes/dots on all of my nails. On my ring and index finger I applied the black and white L'oreal Confetti topcoat. On my middle finger and thumb I stamped an image from BM321 with Konad white and on my ring finger I did a dotticure with all the base colors. Quick and easy, perfect for hot weather! I hope you guys like it, and see you next week! Ohh, these are awesome! I love the colors and that glitter! 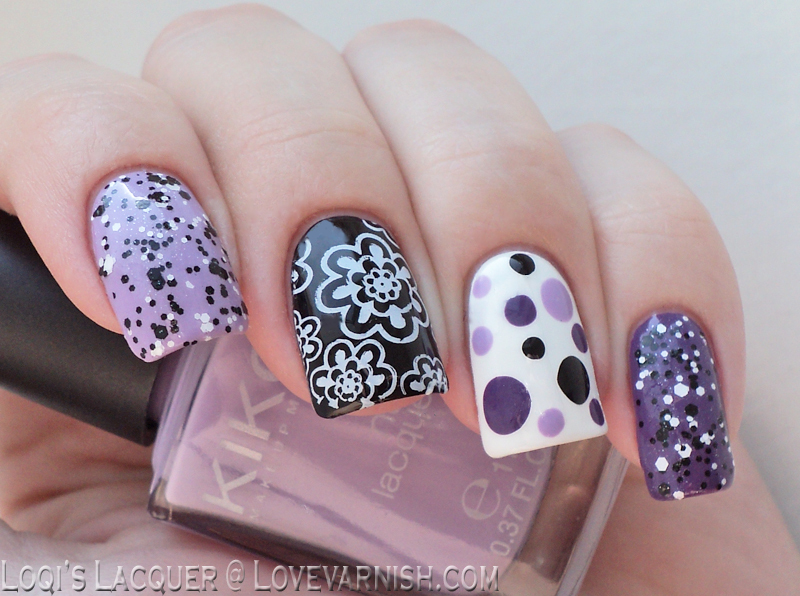 This is such a pretty combination of colours and nail art! Love it! Really cute mani! I love that confetti topper! It's been too hot in Sweden as well, uuuh, but this week it will be a little bit cooler, they say. I found a way to make a homemade air conditioner on line and saved it. It uses a bucket of ice and a fan with some vent holes cut into the bucket for the cold air to blow out. We have central air, but I saved the article because I am a hoarder with info like that. I love your mani. I am participating in a nail art challenge and am stumped by tomorrow's mani "glitter". It sound easy but I don't want to copy anyone else's design and want something original where glitter makes the mani. Something like this. Your mani would be perfect for the challenge. Love purple! Love this skittlette, it's just gorgeous! I wish it was warmer here, but I do feel your pain, painting nails whilst sweating profusely is the worst! Skittletes are so much fun! I love that kiko polish, I have it too and it's just so soft and creamy :) great colour combo choice, too! Love it all! I love these mix & match nails Manon!! They all work so nicely together and of course I love the purple hues.